So far, I've removed the near-dead battery (so sayeth the guy who sold it to me), and disassembled the wiring and components that were inside the right side ammo can/saddlebag. 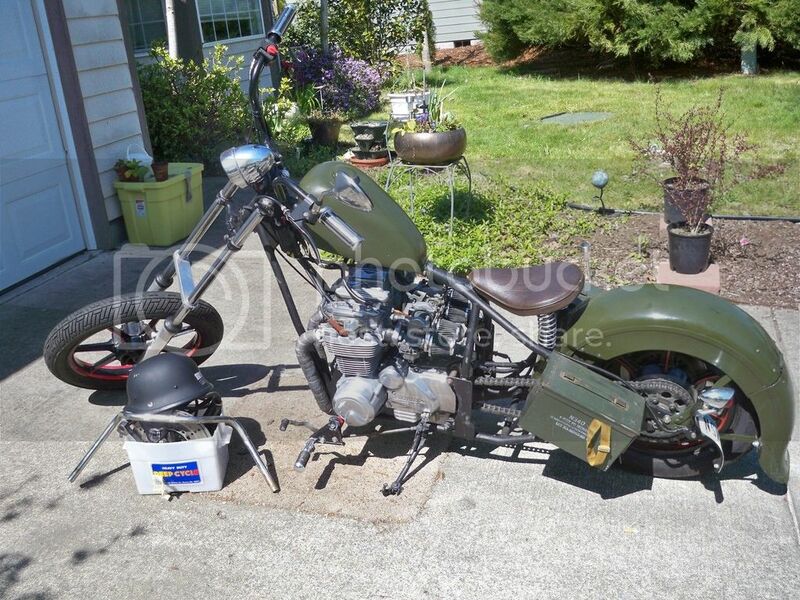 Removed ammo can saddlebags as well as tail fender and seat. Foot pegs were not my bag, so those went too, and I've taken off the back light and license plate mount. I think that's where I'm at so far. I'd like to remove the gas tank for a bigger gas tank, but that feels like a 'last step' kind of thing. So I'll take care of the framework and cosmetic stuff I want done to it now, because that's the stuff I can do with my knowledge so far, and then move onto the complexities of the engine I got myself into. I've never operated a motorcycle. I've operated off-road trikes using the clutch/foot pedal gear adjust and right grip throttle setup (forgive my extreme 'lay' terms here, total noob to motorized bikes and working on them or any part of them), but it's been a while. I'm into this bike to learn how to work it, how it works, and how to maintain and understand it. I never did understand stuff much until I took it apart first. Since it's already a chopper, I figured hell I'm already on the right track. The guy jumped it for me and rode it up and down my street when he dropped it off, so I know it's functional and all that jazz. I also know it's old and it needs work and I don't even know what kind yet, just that it does. I have a couple manuals from ebay coming to me, and the front disc brake assembly, and a few odds and ends that came with it, but I understand everything I want to do is going to cost money, and so this will be the standard step-by-step procedure. I'm in no rush, I've already had fun with it, even if I've never ridden it. I've already begun taking apart the cosmetic things because I want bigger ammo cans, 25mm ammo cans to be precise, a better fender, a bigger seat, and a rack for those ammo cans to sit on that can be adjusted to be without the ammo cans as well. Me and a buddy will weld that up. Bigger gas tank, LED lights the whole way 'round... better OD Green paint job, possibly with Dad's Army symbols on it... Also OD green rims? Or black rims with a OD green 'white wall' tire effect? Not sure yet, but, I'm not there yet either. Unlike a trike, a motorcycle does not go upright around corners. Having a look at your bike I would guess you may find out that the hard way, soon. So be very careful! Justanotherdood wrote: I'm into this bike to learn how to work it, how it works, and how to maintain and understand it. I also know it's old and it needs work and I don't even know what kind yet, just that it does. Moreover it needs a front brake! Justanotherdood wrote: ... , but I understand everything I want to do is going to cost money, and so this will be the standard step-by-step procedure. I'm in no rush, I've already had fun with it, even if I've never ridden it. This bike is extremely dangerous because of the risk of ground contact in corners and the missing front brake. Welcome here! It looks very interesting. Please add a front brake to your list of things to do. Yes, the brake is already in my parts list, already have it. Just needs a longer brake cable. I'd imagine it's going to be several months before I actually get to ride it. I wasn't planning on riding and learning to ride until next year, I just wanted to get the bike and start working on it so that it would be ready for when I am ready. See you all around, will post some more pics as I update and work on the monster. I merged your two threads into one. No need to have two on the same topic. Oh cool, thanks! Every forum does it different, and some forums are down right mean about placement, which is why I usually end up lurking & reading. Going to spend today trying to design out the frame for the 25mm cans, and the fender. Then I'll get in touch with my welding shop buddy, and see what we can do. So much work, so little time! But it's fun stuff, so I'm having a good time. 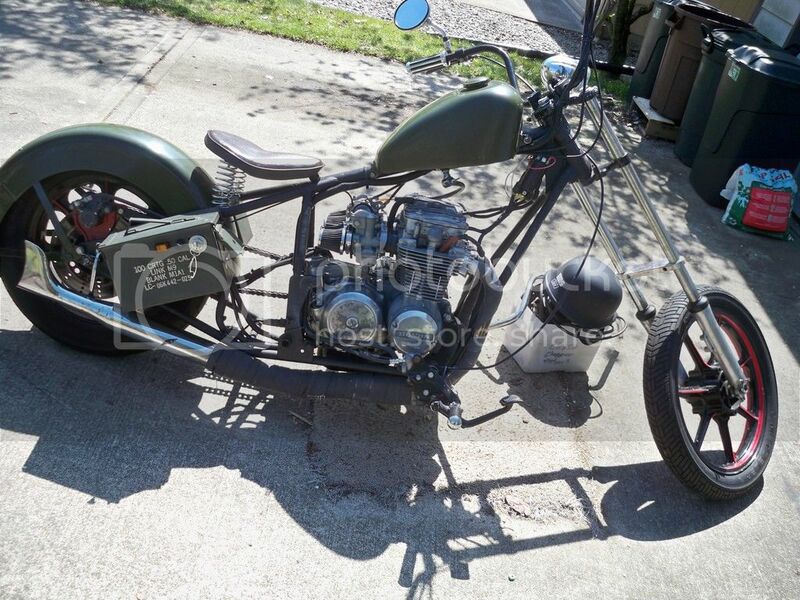 It's inoperable right now, so no one needs to worry about the front brake, it'll get installed, but for right now it's a frame, 2 wheels, an engine, and a set of forks. It's not ready, and that's okay. I still have yet to learn the wiring for this, and LED's, and to obtain all those parts, the list is fairly long, but by the time I get to riding this thing, I'll know most everything about it I need to ride it, work on it, fix it when it needs it, and a general idea on how to do it, or to find out how. Already tons of info on this site, so that's where I'm off to... More reading yet!